The SPECT / CT (single-photon emission tomography / computer tomography) is considered to be one of the most modern diagnostic methods. It collects information (e.g. metabolic activity of the bone) at a molecular level and converts these into detailed layer images. SPECT is a nuclear medicine tomographc imaging technique using gamma rays. 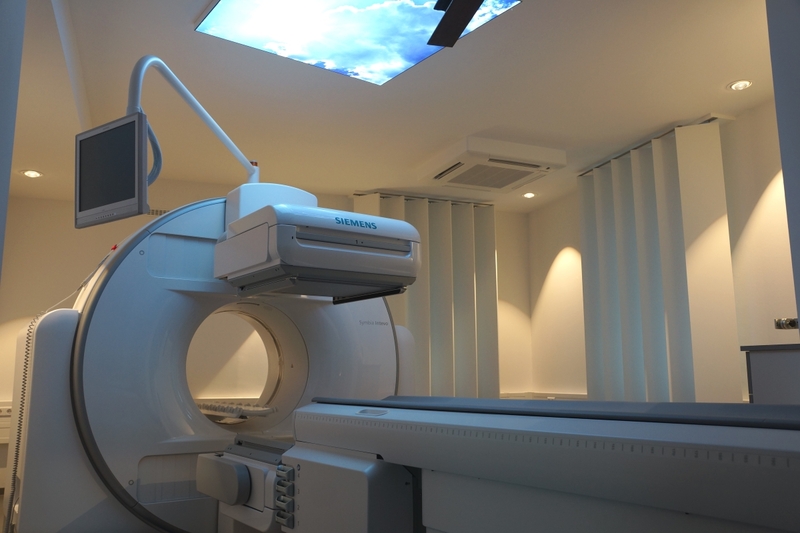 It is very similar to conventional nuclear medicine planar imaging using a gamma camera (called scintigraphy). Radiotracers are injected at a very low and harmless dose, which can make metabolic processes visible. However, it is able to provide true 3D information. The modern SPECT / CT devices have a much higher spatial resolution and thus a higher image quality than conventional gamma cameras with additional SPECT. The similarity between SPECT and CT in the method of image processing allows the images to be combined. Combining the information from a nuclear medicine SPECT study and a CT study allows the information about function from the nuclear medicine study to be easily combined with the information about how the body structure “looks” in the CT study. The combination of SPECT and CT in one examination allows more precise diagnoses to be made in only one examination procedure. Multimodal imaging using SPECT / CT improves the sensitivity and specificity of nuclear medical radiological diagnostics for various clinical questions in orthopedics, oncology, endocrinology and cardiology. Skeletal SPECT / CT Can detail both bone metabolism and bone structure. Arthritis, bone metastases, prosthesis loosening, fractures, infections, osteonecrosis / -porosis as well as Sudeck’s dystrophy can be diagnosed with high precision. SPECT/CT is redefining the diagnostic workup of patients with suspected or known infectious and inflammatory processes involving the musculoskeletal system as well as those with infectious and inflammatory disease located in various soft-tissue sites. In this way, enlarged parathyroid glands can be correctly assigned, which is important for an operative therapy. Accurate and faster heart muscle diagnostics by using CT. Thin layered images result in a 3D image of the entire cardiac blood circulation. Cardiac SPECT is used to diagnose coronary artery disease and find out if a heart attack has occurred. SPECT can show how well blood is flowing to the heart and how well the heart is working. • Please set aside 2 – 3 hours for your stay. • Thereafter, there are variable examination protocols, which are individually adapted to the question concerning you. You will be informed about the exact. • Subsequently, there will be performed one or more image recordings – including computed tomography of the affected body section. The test substances are specially prepared for each patient and very expensive. We therefore ask you to timely inform us if you are unable to attend your appointment (not later than 5PM on the day before). Our interdisciplinary medical team has many years of experience in nuclear medicine and radiology at universities and in practice. If you have any questions do not hesitate to contact us! • Myocardial scintigraphy (myocardial perfusion), the application of low-dose CT corrects photon absorption, which improves the specificity of myocardial scintigraphy up to 90%.